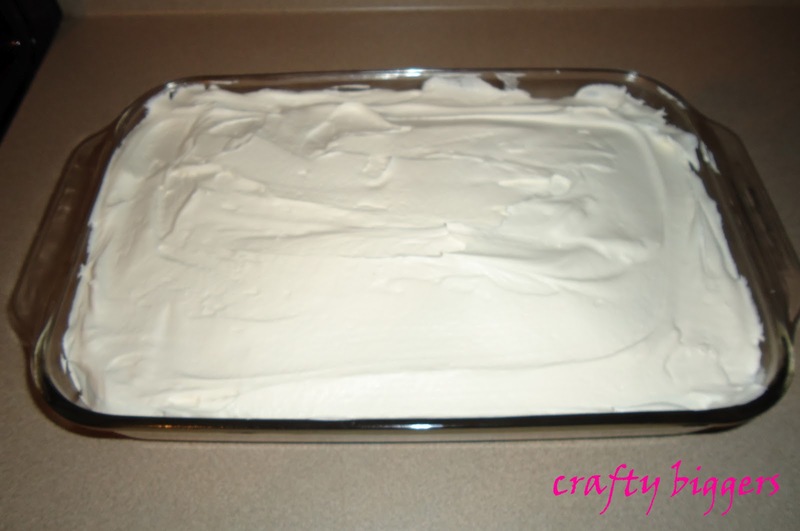 This is probably the easiest and best cake EVER. No seriously. 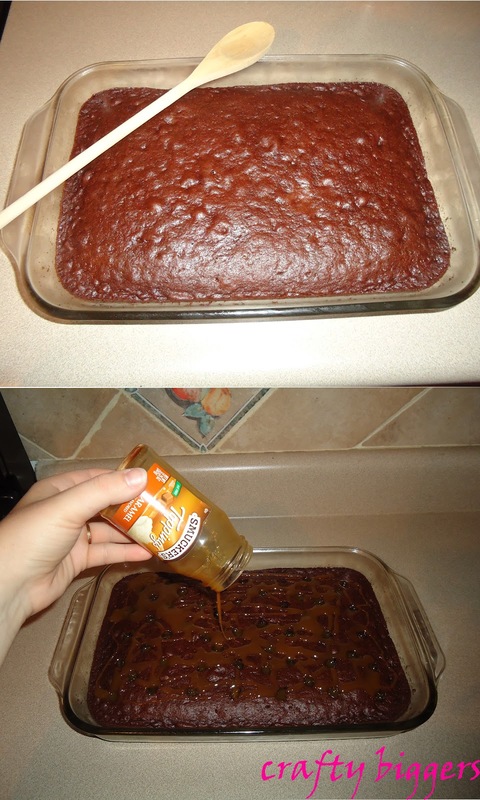 It's amazing and only 4 ingredients. I remember my parents making this for us when we were kids except they used Skor bars (we were stationed in England) but it's basically the same thing. It the most requested birthday cake from the guys at work. 1.You start with a chocolate cake in a 9x13 pan. Any chocolate will do. 2. Next you will need to poke holes all along the top of the cake. I use the end of a wooden spoon because that's what my parents used. It works great. 3. Then you take your caramel topping and fill in all the holes. I prefer to use the stuff that comes in a jar, but the squeeze bottle works too. It just comes out thinner. 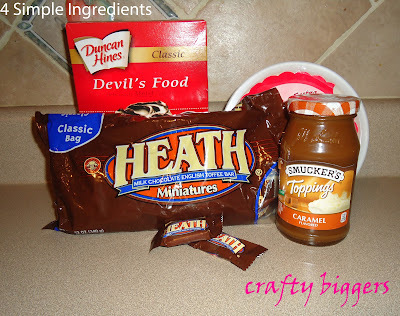 In a pinch I've even melted down caramel candies with a little milk to get a sauce. 4. After the caramel comes the cool whip. See, it just keeps getting better and better. The extra creamy makes for a better 'frosting'. 5. Now for the CANDY!!!!! haha It's easier to break up the candy if it's been refridgerated or frozen. 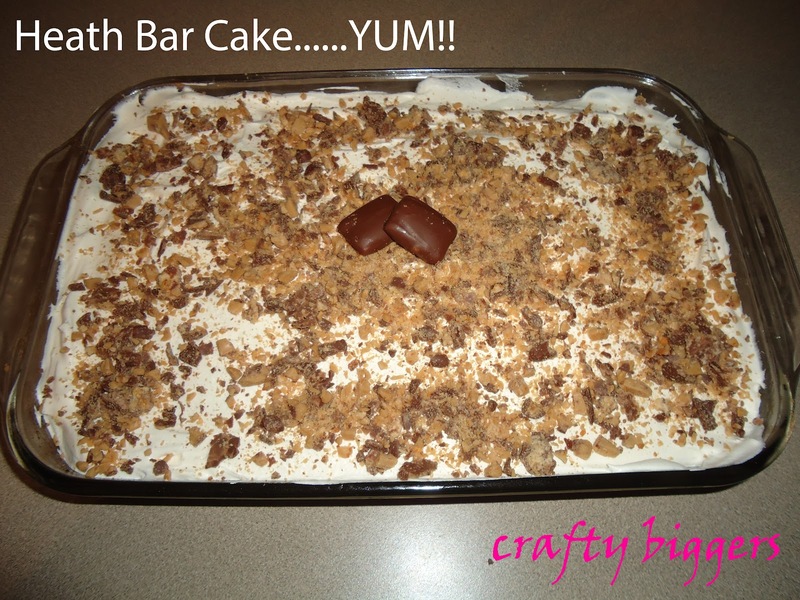 You don't want a mushy canybar mess. 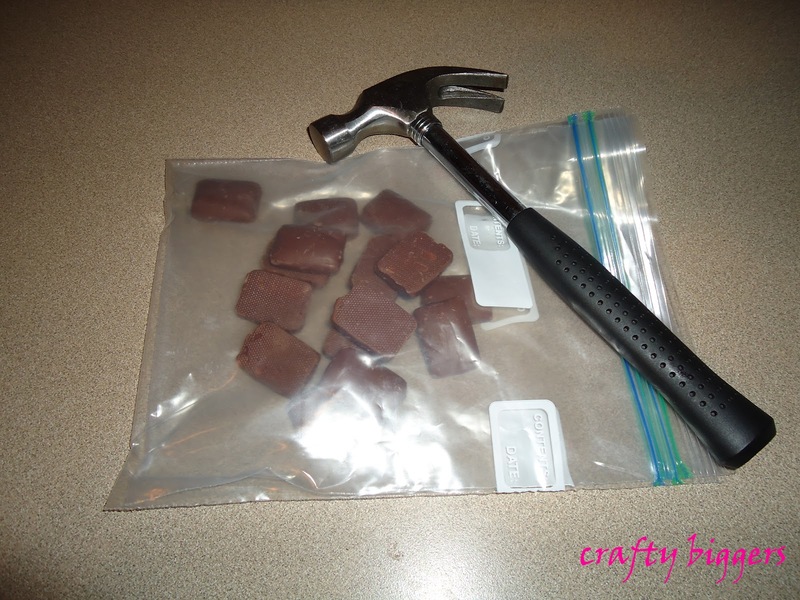 :) This is how I break my candy. I double bag the candy in freezer bags so it doesn't break through. 6. Last step, throw the candy on top and keep it in the fridge until you are ready to eat it. It's awesome. Maddie was sad when I told her it was going to work with me tomorrow fora co-workers birthday. The cake was amazing! Thanks for posting the directions. Sweet! Your newest follower via blog hop. Would love for you to follow back!? OMG, that looks delish!!! Stopping by from the blog hop and am now your newest follower:) Hope you can come check out Crazy Mama Drama ! My boys will love this cake. And i like it because it looks easy. I'm stopping by from Aloha Blog hop. I'm Leslie @ Gwen Moss blog (10 things that you should always ...) You've got a great blog. Stop by when you get a chance! My girls love it too, but it's so easy to put together that they love helping to make it as well. This looks so yummy I think I will have to make it for the next meeting I attend. Thanks for sharing! 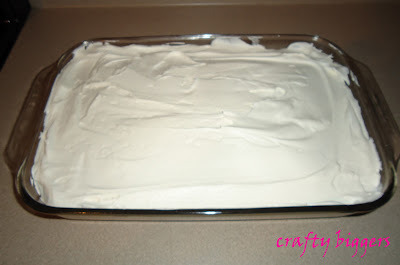 ive never made a good cake-maybe this will be my first! thank you!! Oh my. This looks soooo yummy! 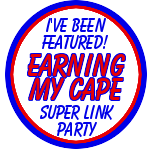 Found you at Earning My Cape's Super Link Party! I've been making this for the last couple of years after someone brought it to a work luncheon! It is soooo yummy =) But I mix my caramel with a small can of condensed milk. This is THE cake to eat though! Oh my heck! This looks so delicious! I would eat way too much of this! Yay! Glad you saw your feature! I see you already grabbed your button. Awesome!